For as long as we’ve been together, Kelli and I have been fond of road tripping. 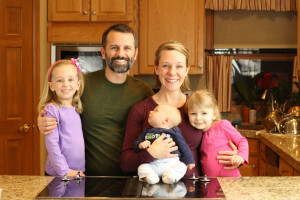 In the early days of our relationship, that meant making the 4-hour drive to her hometown of Ithaca, NY; or the 5-hour drive to the Adirondack Mountains; or the even longer drive to the Presidential Range in northern New Hampshire. When we moved to Colorado, it took the form of long drives across Wyoming’s Red Desert; or out I-70 to Grand Junction and Colorado’s Western Slope; or even 2,000 miles back to New York one year, when a blizzard shut Denver International Airport days before Christmas, and we didn’t want to miss the holiday with family. Back then, snacks on such road trips tended to be defined by foods that otherwise weren’t a part of our diet. We ate them exclusively on road trips. It eventually became a strong association. Take Corn Nuts. It’s been years since I’ve had them. We tend not to eat that type of snack food these days. But I can’t tell you how many small bags of Corn Nuts we went through on drives to and from our then-home in New Jersey and Kelli’s hometown in upstate New York. These days, when we gas up the car, if the stop happens to require popping in to the station’s mini-mart, seeing the ubiquitous racks of Corn Nuts recalls those days way back when. And what do Corn Nuts have to do with today’s product review? All will be revealed in a moment. A new company called Halfpops recently contacted us, offering to send gratis samples for us to review. Described as partially popped popcorn (hence, half-popped), we were willing to give it a try. Though we don’t eat Corn Nuts these days the way we used to, we’re known to pop a fresh batch of popcorn from time to time, and sometimes even make it with a little sugar in the Belgian style (which tastes remarkably like kettle corn). How would we like these Halfpops, we wondered? Halfpops are certified gluten-free by the Gluten-Free Certification Organization, which gives a comforting and stringent third-party verification of the products’ GF status. Yeah for Halfpops earning GFCO certification! Another plus is the simple ingredients labels on the two Halfpops flavors we sampled. The Natural Butter & Pure Ocean Sea Salt flavor contains just popcorn, canola oil, butter, and sea salt. That’s it. Similarly, the Natural Aged White Cheddar contains popcorn, canola oil, cheddar cheese, whey, dry buttermilk, and sea salt. Given that the popcorn is air-popped, I was a bit dismayed to see canola oil as the second ingredient. I’d prefer to see no oil, or at least an oil other than canola. I suspect they might use some oil to help the salt and other flavorings stick to the Halfpops. The flavors also tend to be just a touch too salty for my taste. The first bites are delicious, but after eating enough, it tends to saturate the palate. But Halfpops are undoubtedly tasty. And their texture? That’s where the Corn Nuts come in. 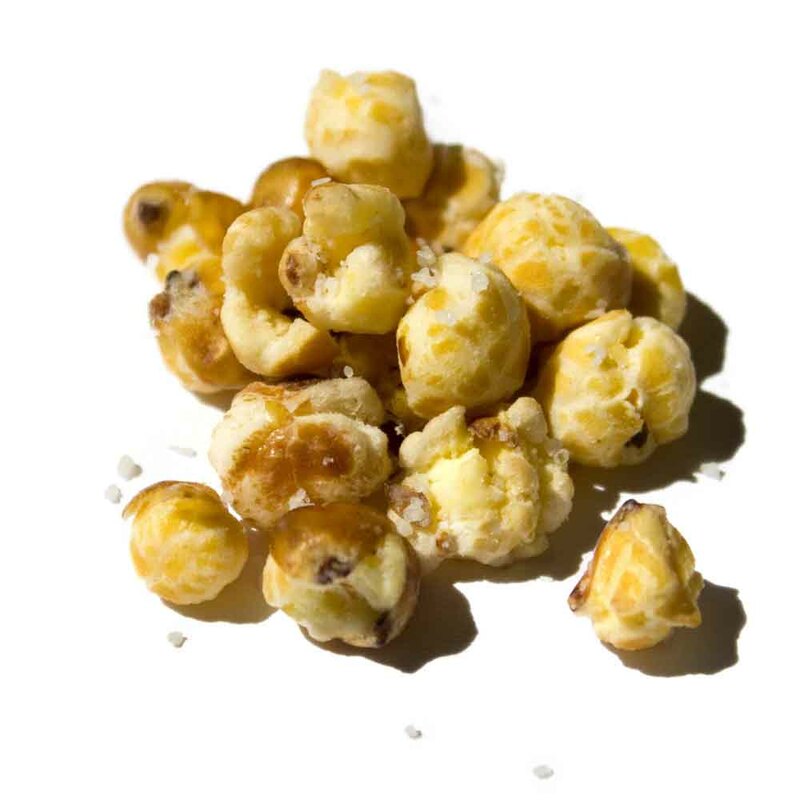 If true light, fluffy popcorn and hard crunchy Corn Nuts had a love child, Halfpops would be their hybrid offspring. Halfpops are both chewy and crunchy. Because they’re harder to chew, we’ve found they’re unsuitable for Charlotte, who’s still waiting on some of her molars, and who tends to choke on the Halfpops. But Marin and Kelli and I all enjoy them. 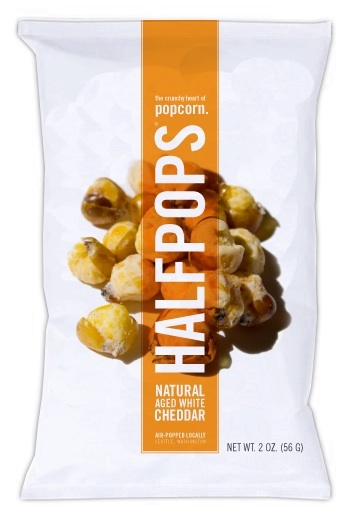 If you’re looking for a new twist on a familiar gluten-free snack (popcorn), Halfpops are worth a look. And, you can do just that in today’s giveaway! As I’ve said in previous posts, our review policy is to only accept as much complimentary product samples as we need to do a review. Surplus gets passed along to you, our beloved readers! Halfpops sent us way more product than we need, so we’re going to give away 4 bags (two 2-ounce bags of each flavor) to one lucky blog reader. Just leave your name and a tidbit about your favorite popcorn snack in the comments. We’ll choose one winner at random and let you know who that person is at the end of next week! I love caramel corn of any variety. Popcorn snacks in general are just so yummy! I love kettle corn! I keep popcorn in my drawer at work for occasional afternoon snacks. There’s just something about those half popped kernels! When I was younger my Mom would always eat my half popped kernels or “jimmy’s” since I was only interested in the fully popped ones. But eventually I decided to see why she loved them! Thanks for the review and giveaway! 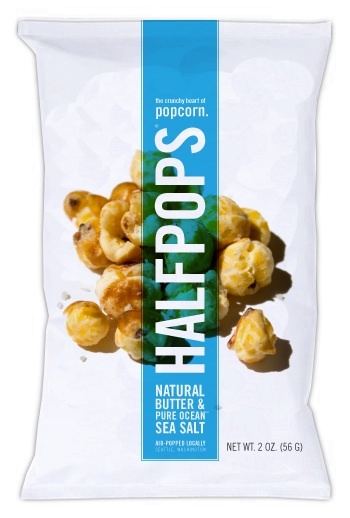 I love the olive oil popcorn from Trader Joe’s, but the Halfpops sound amazing. Yum!!! I can’t wait to try it! I love kettle corn!!!! With the sweet and salty mix! YUM!!!! I love Angie’s artisan treats Kettle corn classic. I buy a large bag to keep at home from Costco and small individual packs too to keep on the go. 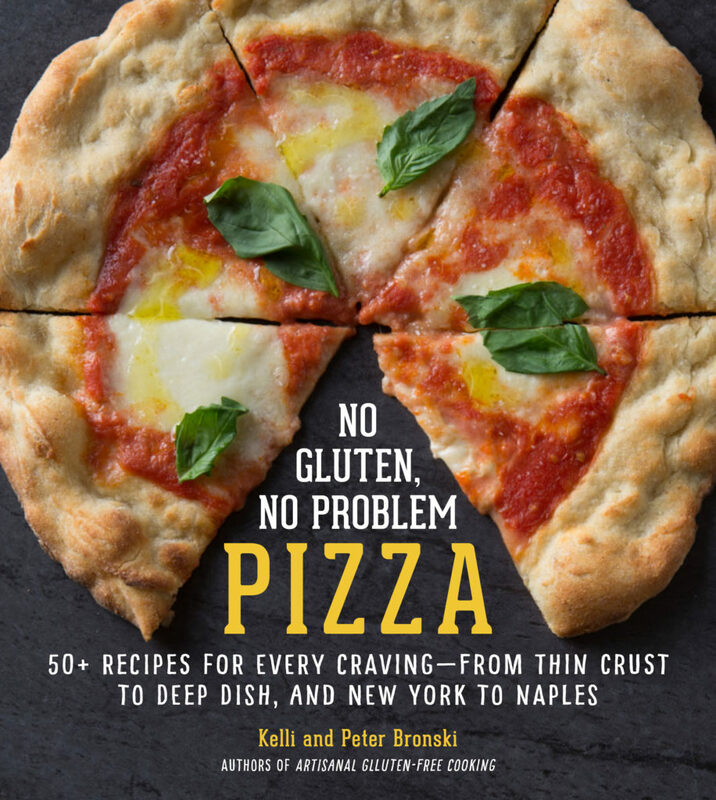 It’s certified gluten free so it’s safe and enjoyable. When I go to the movies I love being able to enjoy popcorn still without having to get sick by bringing a small bag it’s healthy and yummy and my tummy is happy! Before I changed my diet/lifestyle after being diagnosed w two autoimmune diseases, I always loved the cheddar/caramel corn mix from my Chicago hometown fave, Garrett’s Popcorn. Also a huge fan of Chicago’s Smart Pop. Now we make our own fun combos at home, my fave is earth balance, agave and chipotle pepper powder with cinnamon agave glazed almonds. We always fight over the bottom of the bowl, so Halfpops sound amazing! Can’t wait to try them! As a kid, I loved popcorn made on the stove. My mom burned it once, and I loved it that way! I think it was the crunchy texture. The half popped kernels were always my favorite growing up even though they were called “old maids” (a term I dislike). Half popped sounds great. I’d try these – any kind of popcorn is great. I like my fersh popped corn with grated Parmesan cheese! Popcorn is my go to snack. Any kind is welcome, my favorite is white cheddar! I am crazy for kettle corn myself, but I grew up eating corn nuts and haven’t had those in years! I bet it would be pan interesting taste! Wow ! I wish someone in New Orleans would start selling these !